I love when I can get out early in the morning. When it is pitch black as I get to my destination, I get excited as I wait for the first hint of light on the eastern horizon. 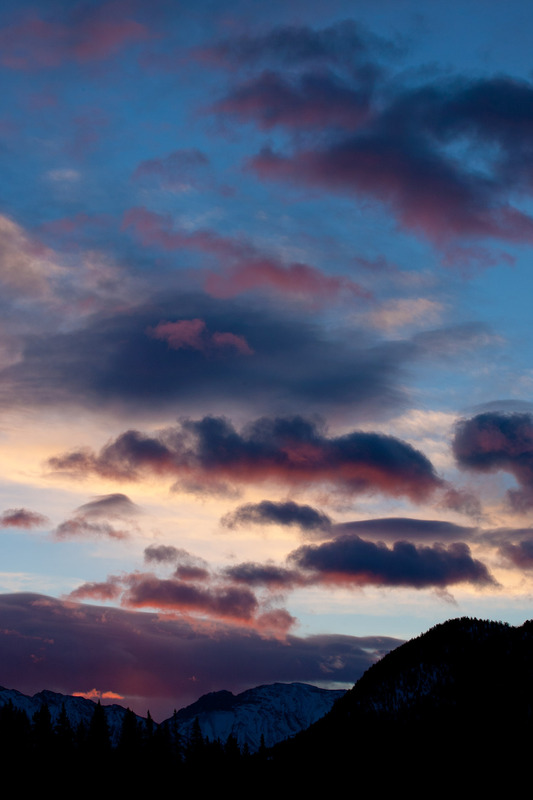 As the sky slowly brightens, there is a magical time ahead of any color in the sky where blues of almost every hue color the world. I enjoyed one of these mornings on the shore of the Vermilion Lakes in the Banff National Park a couple of weeks ago. 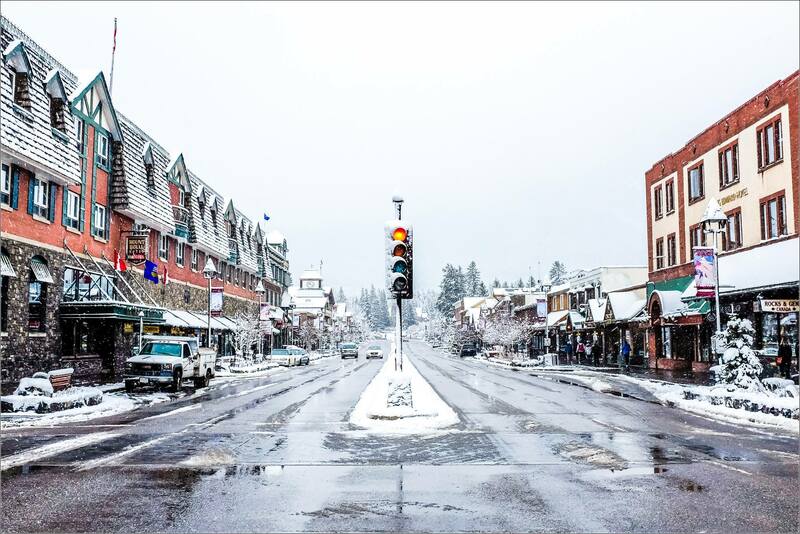 The snow returned for a weekend long storm. 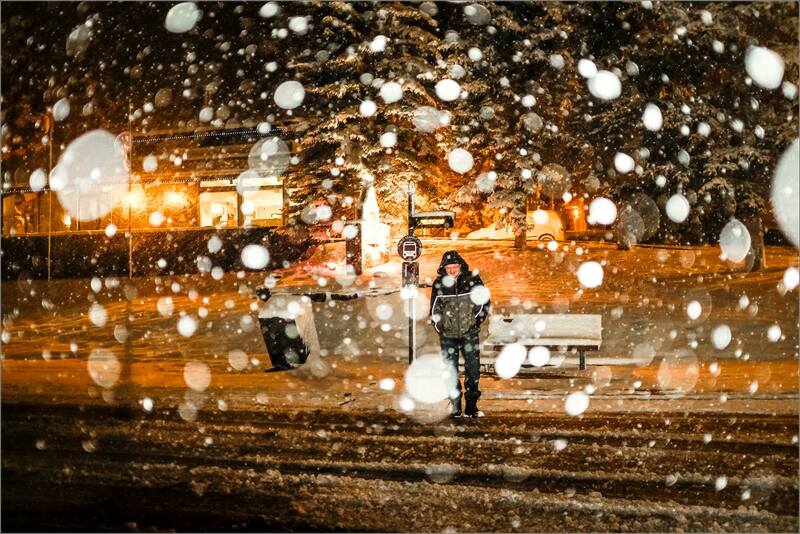 I was in Banff for a night and this was the town on Saturday morning. Heavy snow then and more since then. The night before I was out for a walk and a friend at the bus stop suggested a photo of the storm. The flash lit up the flakes of snow between me and them and illustrate this spring storm’s intensity. 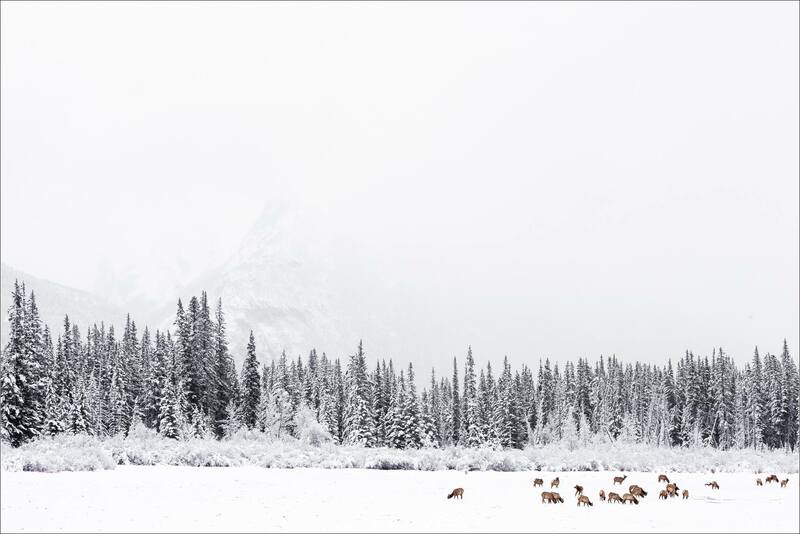 A herd of elk fanned out on the edge of the first Vermilion Lake and, with a slight break in the low cloud, one flank of Mount Rundle came into view to make for a nice scene. Mount Peechee stands a few kilometers east of Banff. From the First Vermilion Lake, the mountain’s ridges dominate the skyline. 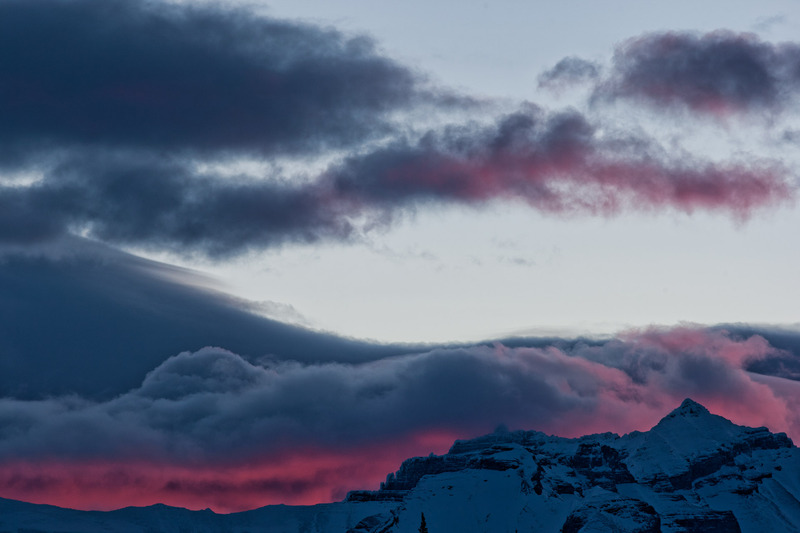 Standing out on the ice just before 8am, I really enjoyed this sunrise over the mountain. Mount Peechee is 9,630 feet making it the third highest of the eight mountains in the Fairholme Range that runs northwest up to Lake Minnewanka. First climbed in 1929, it is now off-limits for hiking which allows it flanks to serves as important pathways for wildlife. 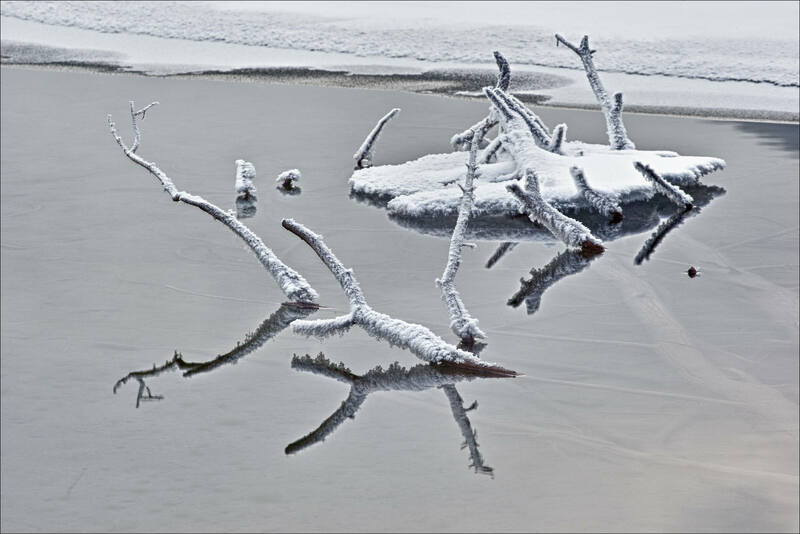 A fantastic subject for landscape photography. 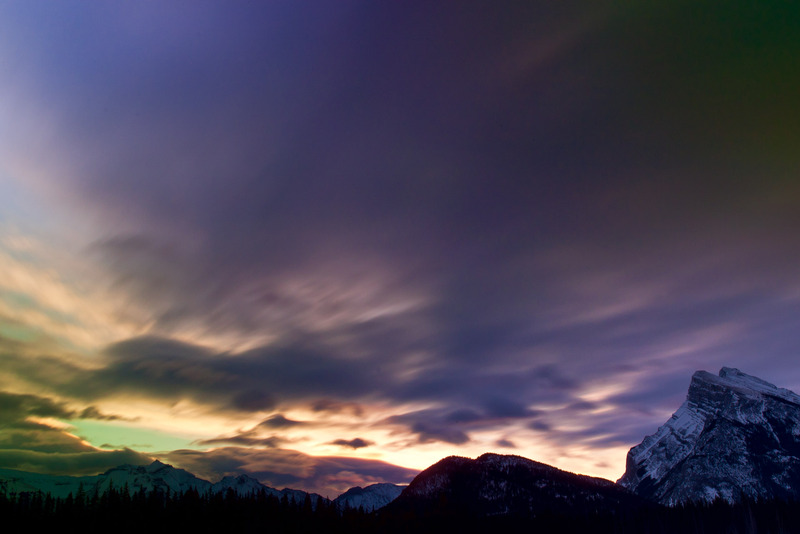 As the early morning pink colors faded, I switched subjects and focused on Mount Rundle and the storm that was moving in from the west. I used a Singh-Ray Vari-ND filter to get a long exposure which stretched the clouds and made the most of the last bit of color from the morning. 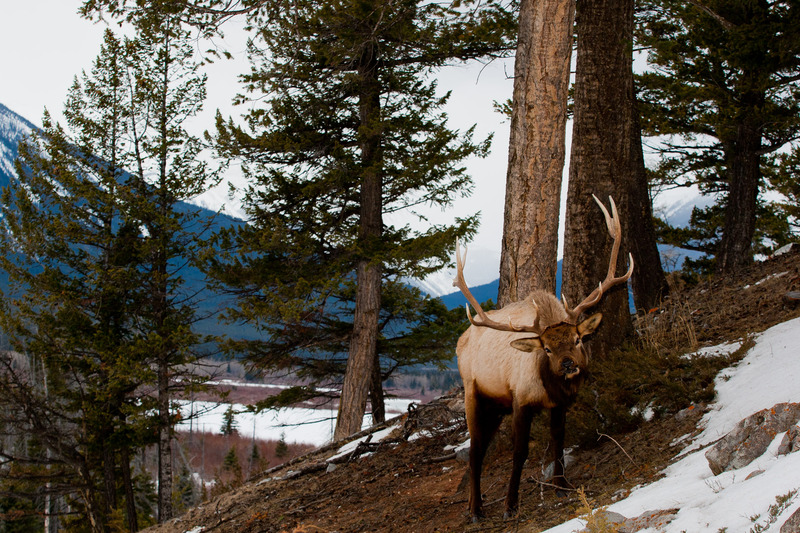 Following my great morning spent photographing the elk, I went down the Vermilion Lake road the next day, Wednesday, with my wife and children to show them the spot where he had been. We stopped there for a few minutes and then carried on to the second lake. 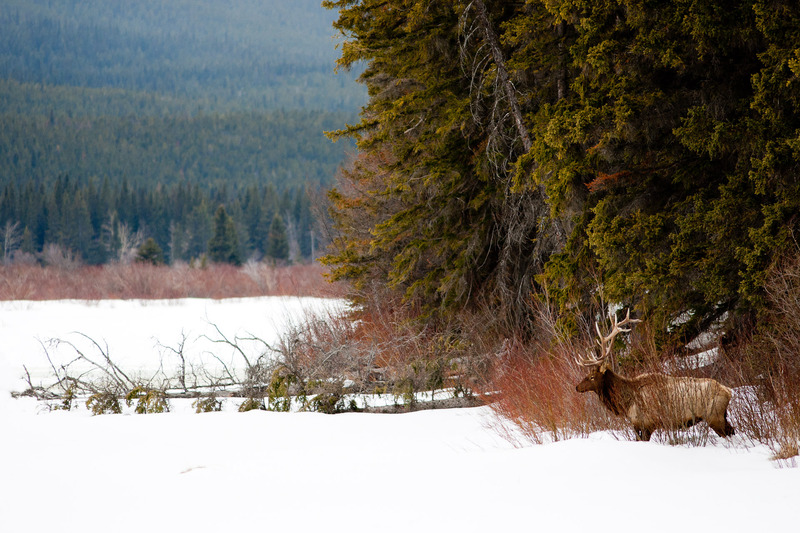 At the edge of the lake I was surprised to see the same elk standing in a couple of feet of snow eating leaves. I didn’t bother him for long in case he had reconsidered our encounter but my family enjoyed seeing him. I didn’t get out photographing again until we checked out on Thursday and we took a quick drive down the lake road just to see if the elk or any other wildlife was hanging around in the middle of the day. After a couple of cloudy days, Thursday was mild and sunny so you never know what might be out warming up. We didn’t see any animals on the drive down the lake but returning I glimpsed the familiar antlers poking up over a bluff near the road. 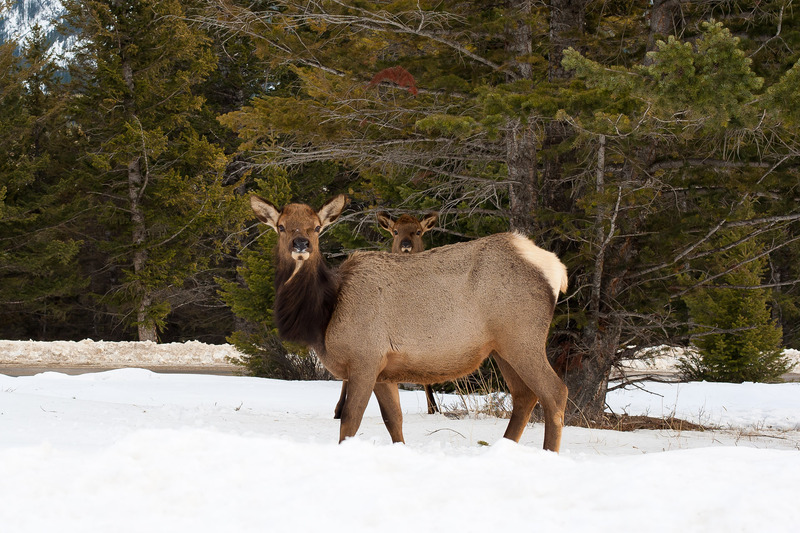 Driving a little further, I took this last image of the elk who defined the photography on this trip to Banff. He was relaxed, with eyes half closed and sitting down facing the sun. It was an easy decision not to bother him. 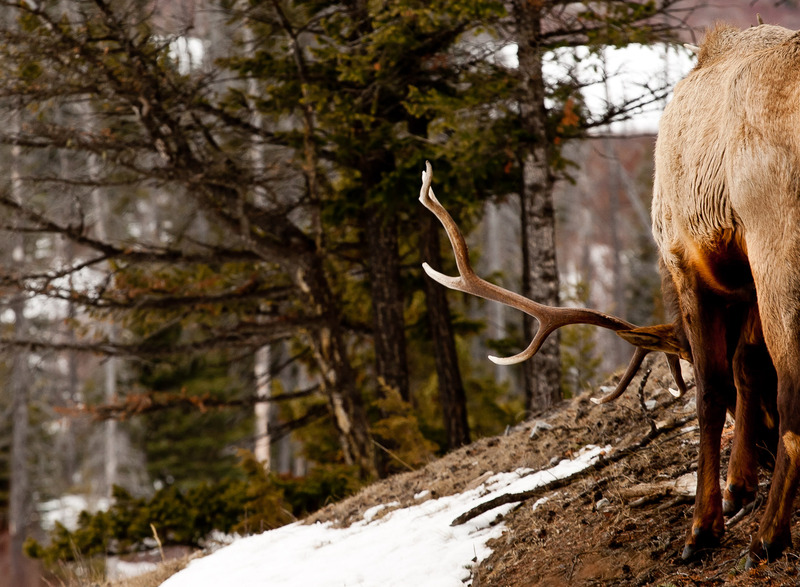 A bit unusual this elk in his habits and territory but I could not see any signs of ill-health or other impediments. Just an interesting animal. I will certainly be looking for him each time I get back to Banff. We’re up in Banff for a few days and staying at the Douglas Fir Resort (nice place with an excellent waterslide for the kids) on Tunnel Mountain. 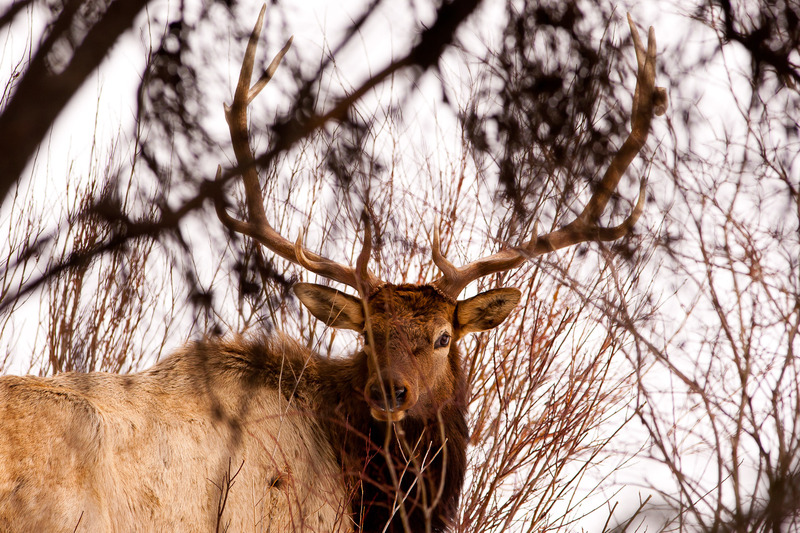 We drove past a few elk (wapiti) cows near the lodge yesterday which served as good foreshadowing for this morning. 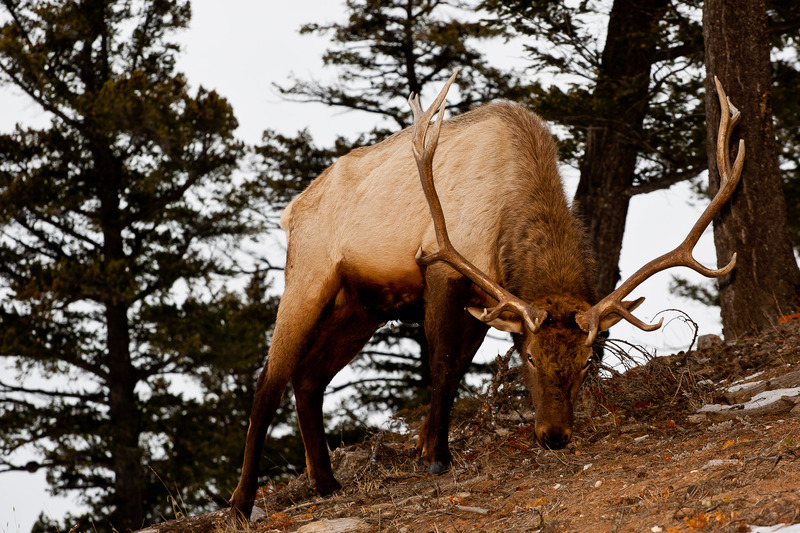 I went down to the Vermilion Lakes for a sunrise shoot and when I was out on the lake edge I noticed this bull elk laying down on the hill above me along the wildlife fence that runs along the highway corridor to prevent wildlife collisions. I carried on with my landscape shooting for almost an hour and when I returned to my car saw the bull had only moved a few meters along the ridge. 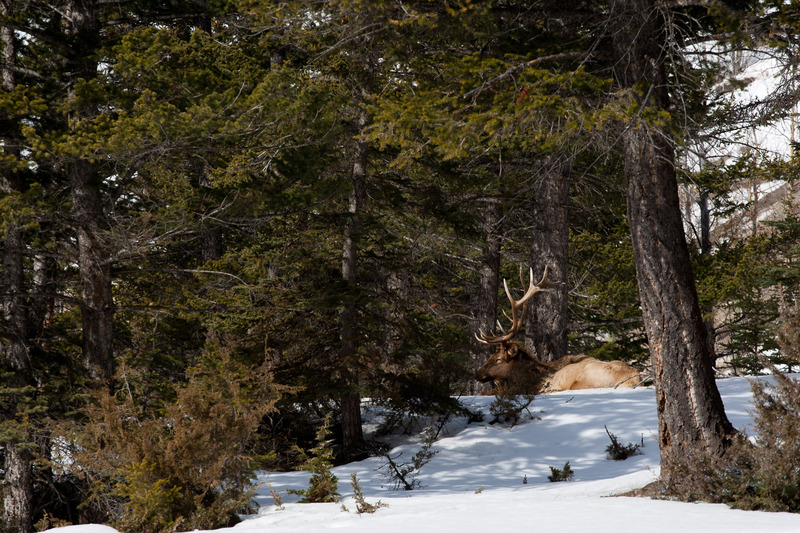 I changed to a telephoto lens and climbed up the mountainside a fair distance away from him. I stayed in sight so he knew where I was and headed up the opposite direction from where his grazing was taking him along the ridge. 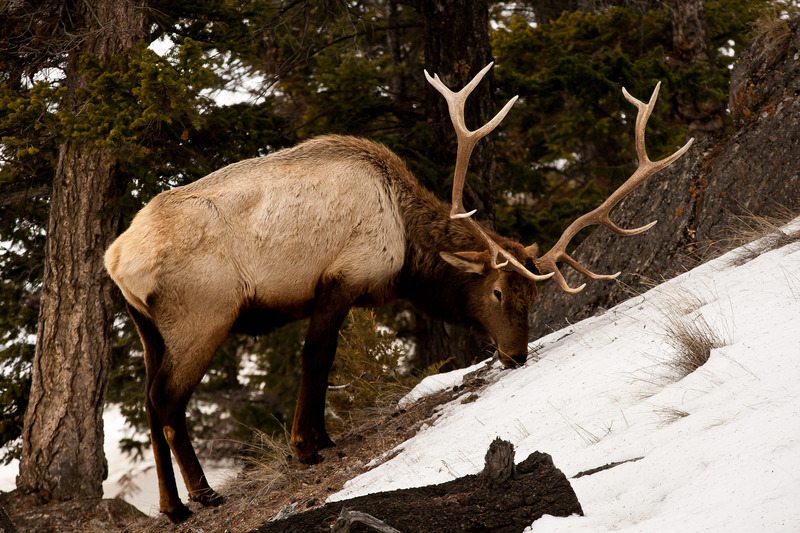 I wasn’t sure if the elk would stick around or trot around the rocks. I was wading through some deep snow so it took a few minutes to get up but he hadn’t wandered away. I set up my tripod and then photographed the beautiful animal for about half an hour before I headed back down. He was eating the whole time and was not bothered by me (a true advantage of longer lenses) so his head was down low most of the time. He did raise his head up a few times, once in response to a train whistle, and I took a couple of those images. Really a great encounter – too bad a little sunlight couldn’t break through the morning cloudbank to bring some warm illumination to that coat – but no complaints. 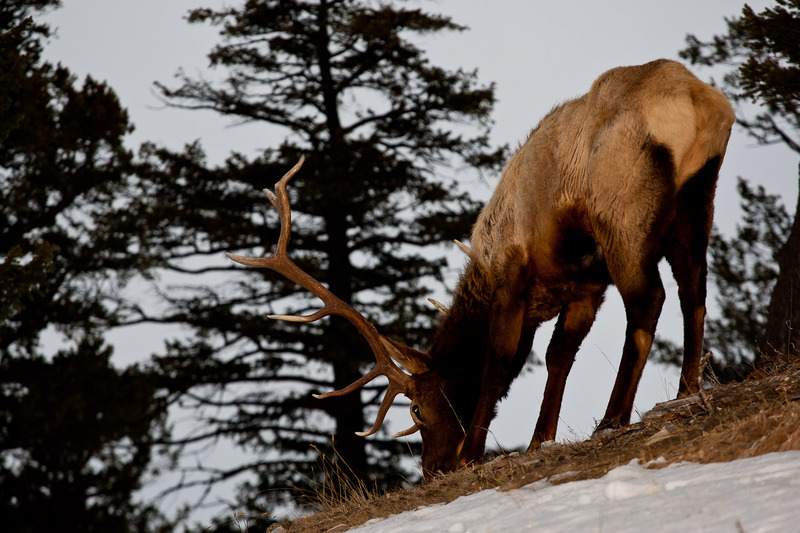 Elk are members of the deer family which, in North America, includes moose, whitetails and mule deer. In sheer size, they aren’t the largest but as you can see with this buck their antlers can be incredible. This fellow is young and skinny. I think the winter has been hard on many animals this year with the cold and the deep snow burning a lot of calories that are hard to come by. A very good reason to look forward to spring. Here I wanted to work with a dominant pattern across the water and up on the mountains. The diagonal lines of the ridges along the mountain slopes were receding into darkness but I had time to work within this composition. With the snow that was falling and being blown around by the wind, the lines fade increasingly into the storm. 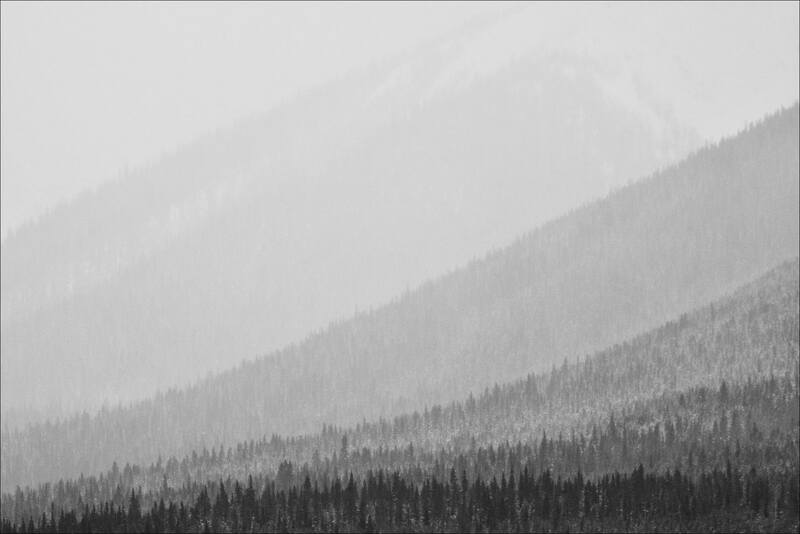 One of the myriad looks of winter in the Canadian Rocky Mountains. 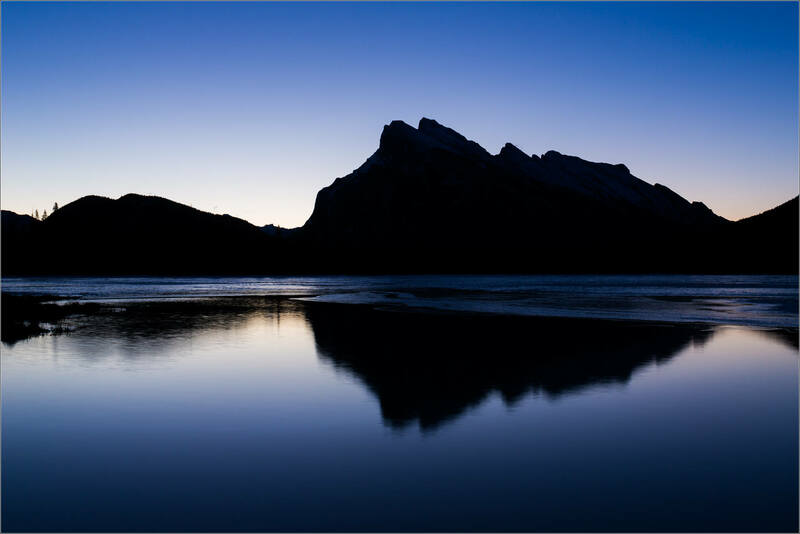 This photograph is from the Third Vermilion Lake just outside the Banff townsite. I was out there for sunset on Saturday and things looked promising when a gap in the clouds started to open up but by the time the sun was low and there would have been some color in the sky, the storm had closed in and the grand sunset landscape was filed into the next time folder. I enjoyed watching the snow fall, an American Dipper play in the hot spring water and the winds blow across the ice and through the trees. It was a very nice evening outside. In several spots along the Vermilion Lakes in the Banff National Park there are sections of open water despite the sustained cold that has frozen over all three lakes this winter. These breaks in the ice are due to runoff from underground hot springs that ring the lakes. The warmer water attracts birds and the occasional mammal in the winter. On the weekend, I saw an American Dipper and followed it flitting amid the reeds and diving for bits in the water. 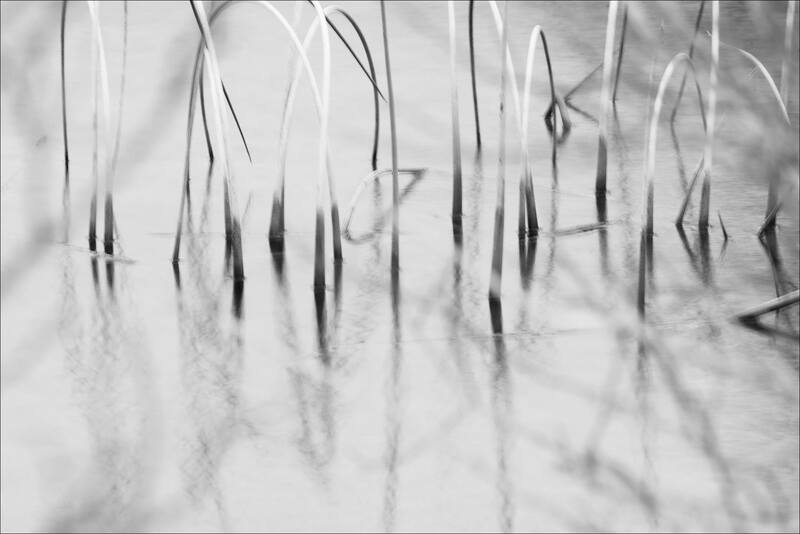 Following that, I turned my attention to working with patterns created by the sticks and reeds and their reflections in the water along the shoreline. Here are two that I liked in particular. One presenting dominant vertical lines and the other creating horizontal movement across the frame. I enjoy working on these type of compositions while waiting for the dramatic landscapes to fill with clouds, light or anything else of interest. Sometimes those come, other times they don’t. Having a list of different types of images I want to create helps avoid a strikeout when things aren’t cooperating.